Asbestos is a mineral rock with a chemical composition of mostly silicon, water, and magnesium. Most asbestos fibers are long, thin, strong, flexible, fireproof, and resistant to chemical attack. Of the six varieties of asbestos fibers found in nature, only three are commonly found in construction materials: chrysotile, amosite, and crocidolite. Chrysotile, the variety most often found in building materials, absorbs water readily, which allows for easier removal. Chrysotile was commonly used as a binding and strengthening agent in plastics, cement, and insulation. Extremely long chrysotile fibers were woven into fire- and heat-resistant cloth. Asbestos is a carcinogen , and medical reports indicate a single fiber can cause lung cancer. There is little health risk if the material is fully intact and is properly maintained; but it can quickly turn dangerous if any of the fibers become friable and airborne, and are inhaled. Asbestos has been used in a wide variety of products and materials. Its positive properties of heat and chemical resistance were discovered early in history: Egyptians wove asbestos fibers into cremation shrouds and the Greeks made lamps with "inextinguishable" wicks of asbestos. Asbestos fibers have been used in approximately 3,000 different applications. At asbestos's commercial peak, the United States used nearly one million tons of asbestos per year. Common asbestos-containing materials (ACM) include thermal and acoustic insulation, fireproofing, concrete, flooring, roofing felts, building papers, shingles, electrical insulation, decorative sprays, gaskets, packing, and textiles. The principal sources of airborne asbestos fibers are the quarrying, mining, milling, manufacturing, and application of asbestos products. Medical reports have documented laboratory and clinical evidence that inhalation of asbestos fibers can lead to an increased risk of developing asbestosis , lung cancer, and mesothelioma . Epidemiological studies also show that the risk of lung cancer increases tenfold for smokers compared to nonsmokers exposed to asbestos. In the past, the individuals at greatest risk of developing these diseases were asbestos workers who were exposed to high concentrations of asbestos fibers each working day with virtually no respiratory protection. The combination of cautionary medical reports and a better-informed public spurred the U.S. Environmental Protection Agency (EPA) to begin banning the manufacture of asbestos-containing products in the early 1970s. Adapted from National Center for Health Statistics multiple cause of death data. 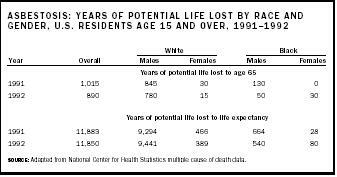 SOURCE: Adapted from National Center for Health Statistics multiple cause of death data. EPA, about 70 percent of the vermiculite mined worldwide came from the Libby mine and most was sold as zonolite attic insulation between 1963 and 1984. The EPA recommends that vermiculite insulation in homes be tested for asbestos. The EPA regulates environmental exposure to asbestos while the Occupational Safety and Health Administration (OSHA) regulates occupational exposure to asbestos. The most recent EPA regulation is the Asbestos Hazard Emergency Response Act (AHERA) for schools. This regulation became effective in 1987 and specifically outlines inspection, reinspection, periodic surveillance, and management plans for all schools to minimize exposure to asbestos. This regulation was considered state-of-the-art when it first came out and it soon became applicable to all public and private buildings. The asbestos workers of today wear high-efficiency respirators and protective clothing to minimize the risk of developing one of the asbestos diseases. OSHA limits a worker's exposure (over an eight-hour, time-weighted average) to no more than 0.2 fibers per cubic centimeter. In the last fifteen years, asbestos regulations have been put into effect, prompting the need for asbestos abatement policies. The current policies on asbestos are centered on the protection of the building occupants and maintenance and repair personnel. Many building occupants believe that any ACM must be removed immediately. In some cases, this is a reasonable choice, but in most situations, immediate removal is not required. To deal with an asbestos material in any building requires planning and continuous management. Improper removal can increase asbestos-related health risks significantly. The first step in developing an effective long-term asbestos management program involves defining the nature and scope of the problem. This requires a complete building survey, including a walk-through of the entire building to include basements, crawl spaces, and attics. Bulk samples of suspected ACM material should be taken, including wallboard, insulation, roofing, floor tile, mastic, fireproofing, plaster, concrete, mortar, sprayed-on ceiling and ceiling panels, exterior siding, and fire doors. The bulk samples of each suspect material should then be analyzed by a certified/accredited laboratory, and a management plan should be developed. The EPA endorses ACM management and recently released a regulation that endorses management versus blanket removal. An operations and maintenance (O&M) program describes the steps to maintain ACM in a building to minimize exposure to airborne asbestos fibers, and to prevent uncontrolled disturbance of ACM. It describes what must be removed, what ACM is repairable, how repairs are performed, and how remaining ACM is maintained and/or repaired. Any ACM that must be removed from a building for offsite disposal will be subject to waste transportation and disposal regulations. Most states require haulers to have waste-transportation permits. Friable asbestos is considered a hazardous substance under the Federal Superfund Law, and therefore requires special handling. Building surveys should be an automatic requirement for any building erected before 1985. Recently, a city in northern California leased an existing movie theater with the intention of renovating it for use as a performing arts theater. Shortly before work was to begin, ACMs were identified in many portions of the facility. The city council was extremely surprised by the presence of asbestos in the building, even though the building was built in 1950. There was no asbestos survey conducted prior to the commencement of the renovation, and the building owner had verbally assured the council that the presence of ACMs was highly unlikely. The project continued, but at substantial, and unexpected, additional expense and delay. Building identification surveys are being conducted by most building owners who want to prevent any costly confrontations with ACMs. The Army Corps of Engineers in Sacramento requires an identification survey for any building that is scheduled for demolition or remodel. These surveys have indicated that mastic, boiler refractory, flexible duct connectors, silver (heat-resistant) paint, and wall taping compound can also contain asbestos and must be tested. Each asbestos identification survey has taught the Corps of Engineers new precautions to take when conducting the next one. All building owners need to have asbestos identified and located, and its condition recorded. An operation and maintenance plan needs to be developed for each building, and maintenance workers need to be educated before they come in contact with asbestos. Legislative and public attention has led to the requirement of a long-term approach aimed at ensuring the safety of those who come into contact with asbestos. SEE ALSO C ANCER ; H EALTH , H UMAN . Agency for Toxic Substances and Disease Registry Asbestos pages. Available from http://www.atsdr.cdc.gov/ToxProfiles/phs9004.html and http://www.atsdr.cdc.gov/HEC/CSEM/asbestos/who's_at_risk.html . EPA's Asbestos and Vemiculite homepage. Available from http://www.epa.gov/asbestos . National Institute for Occupational Safety and Health Asbestos topic page. Available from http://www.cdc.gov/niosh/topics/asbestos . OSHA Web site. Asbestos information pages. Available from http://www.osha-slc.gov/SLTC .